Have you seen the commercial for Febreze? It warns of going “noseblind” to smells in your home. That’s a great description for what happens when you live with odors in your home that you just don’t notice any longer. 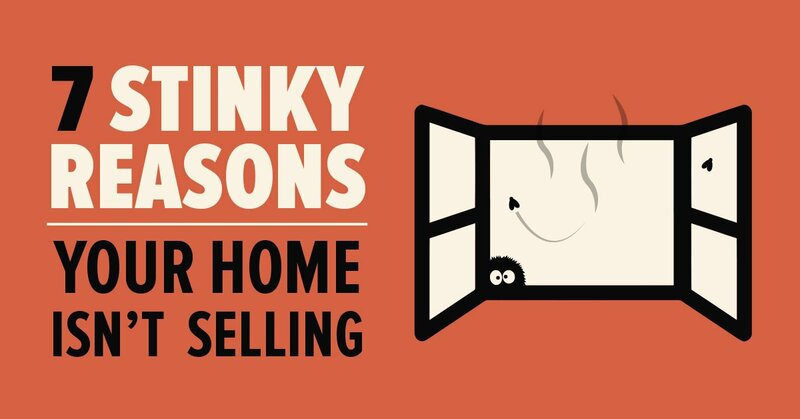 But if your home is listed for sale, your buyers are not “noseblind” to those unpleasant odors and they’re keeping you from getting good offers. You need to take a critical eye – or in this case – a critical nose to your home and eliminate the smells that keep buyers from seeing your home as a place they could live so you can sell your home fast. 1. Cigarette Smoke: It’s very hard to sell a home that reeks of cigarette smoke. The smell permeates throughout the home and into the walls and paint. Even smokers who go outside to smoke can allow the trace to enter the home and linger. If you are serious about selling for top dollar, you should address the smell of smoke. Often this is not easy, nor cheap. The first step might be to remove all the furnishing from the home. Cigarette smoke is not just in the house, it’s lodged in the furniture. Remove everything from the house and then clean thoroughly. The best option is to replace carpet and repaint, but if that’s not possible, then you need to bring in specialists. Mold remediation companies are adept at this type of work and can talk with you about your options. They can clean the air and scrub surfaces for you. 2. Mold and Mildew: Mold is a popular topic in real estate right now. While not all mold is dangerous, there is no way to tell without having a professional mold inspection. Certainly, you do not want to hide any serious problems, but sometimes musty smells are simply due to lack of circulation or living near water. If you find actual mold growth in your home, you must act now. Many buyers will just pass on your home because they don’t want to inherit this type of problem. Call in a professional mold inspector and get the facts. You may see the remediation cost is covered by your homeowner’s insurance, so look for all the facts. Do not use bleach to remove mold spores! This can create a dangerous living environment as they can enter the air stream. You can solve the musty mold smell issue by using a dehumidifier. You can also find moisture absorbing pouches to hang in closets and other small spaces. Open windows and doors to air out the area for good air circulation. 3. Last Night’s Dinner: That delicious tilapia you made last night for dinner could be creating unpleasant scents the next day. Your chef’s kitchen should look and smell inviting and clean. While you have the home for sale, put away the strong spices and food such as curry, garlic, fish or deep fryers. 4. Did You Shower After That Workout? There is no easy way to say this…. your home has people smells. A dirty bathroom or a laundry hamper of dirty clothes gives off an unpleasant stink. Buyers are often willing to overlook dirt in many areas of the home but disgusting bathrooms can really turn them off. Closets are also big culprits of the body odors with dirty clothes and stinky shoes. The best solution is to clean. Clean repeatedly and methodically. If your home is listed for sale, consider hiring a professional house cleaner to come every week and keep the home sparkling. If that’s not reasonable, then you must do it yourself. Don’t allow laundry to pile up. Wash bathroom towels and bedding regularly. Use an odor absorber in the closet. These are beads which soak up smells with little to no fragrance. Put sachets into offending shoes to absorb odors. 5. Air Fresheners: Keep an editing nose for air fresheners and candles. One aromatic candle in the living room is welcoming while one in each room can be nauseating. The scent you choose should be related to the home, not the star. In the summer months, a nice citrus smell is fresh and bright. For winter months, you can go a little stronger with a cranberry or apple. Less is more with artificial fragrances. If you do need to use more than one candle to permeate the home, use the same fragrance throughout. Home buyers will become accustomed to the scent as they move through the house and it becomes a nice extra bonus. When you vary the scents, buyers notice the new scent in each room before seeing the room itself and it’s distracting. 6. Garbage: Garbage cans are found in many locations in the home. Waste cans in bedrooms, bathrooms, kitchen and garage can all harbor unpleasant smells. Home buyers might not even recognize the source, but the odor will reach them. The simple fix is to empty trash often and move any receptacles to an outdoor location if possible. Wash trash cans to remove any spills and stay on top of the process while your home is on the market. If you keep kitchen trash in a cupboard, move it if possible. If that’s not convenient, then look at some of the odor absorbing trash liners as a solution and empty often. The best option for eliminating this objection is to treat any affected areas. Carpet cleaners can help with mistakes on carpet and upholstery and a solid scrubbing of hard surfaces is a must before opening your home for showings. Keep the litter box clean and use a pet smell cleaner around the area for spills. Don’t neglect the garage either. A closed garage gets stuffy and if the pets have been allowed to use that area as their bathroom, the smell is liable to hit buyers as they enter the garage like a brick wall. Clean garage floors with a mixture of soap and baking soda and give it a good scrub and wash.
You never want potential home buyers to refer to your home as “That Stinky House.” Fortunately, most odors are easy enough to remove. Selling your home is a big financial transaction and even if the smells require professional attention, the effort to remediate them could be well worth it, resulting in thousands of additional dollars in your pocket at closing. Many thanks to Brannan Glessner from Express Home Buyers for sharing such knowledge with us.